West face of Sri Pada, a bit lower than the summit from the Ratnapura path. In recent years the annual pilgrimage to Sri Lanka’s sacred peak of Sri Pada has grown and the mountain is visited by thousands of pilgrims, hikers and others during its six month season (between the December and Vesak poyas). For most visitors this means an experience of negotiating the pathways with large numbers of people and at times there are human traffic jams amidst the cloud forest trails. One solution to this challenge of congestion is to visit the peak during the off-season. You gamble with the weather but if the timing is right and you are lucky, you can experience the peak, its landscape and ecology much the way that the very first pilgrims did thousands of years ago. Last month I had the opportunity to do precisely that as I led a small group of students and teachers up to Sri Pada two weeks before the season started on December 27th. This is the 6th year that the OSC IBDP Environmental Systems and Societies has visited Sri Pada to learn about it ecology and cultural traditions. The group was small but filled with enthusiasm and energy for the challenge. Like our school it was international group: one Korean, a South African, a Japanese Sri Lankan, a Peruvian Sri Lankan, a Maldivian, a British-Sri Lankan and then me! As has been our tradition, we based ourselves at the Fishing Hut and then hiked to the peak on the 2nd day. We carried up food and gear in order to spend the night on the temple floor. Once again the temple authorities (there were only two young men on duty) helped facilitate our stay and gave us a room to use. The dominant land use in the Central Highlands is large scale tea plantation agriculture. Surprisingly there are still some areas being cleared for new plantations. 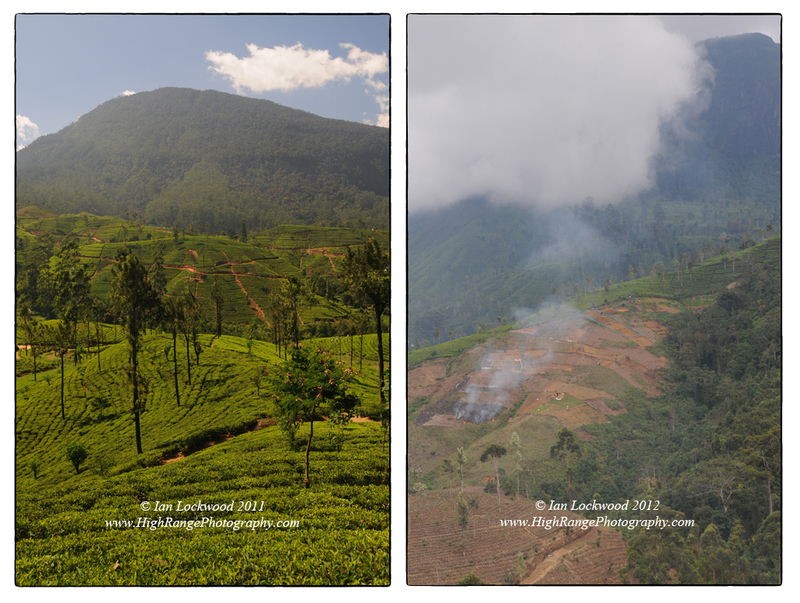 The image on the right shows new tea gardens being established on degraded lands (presumably a former, abandoned estate). However the close proximity of the sub-montane forest is notable. 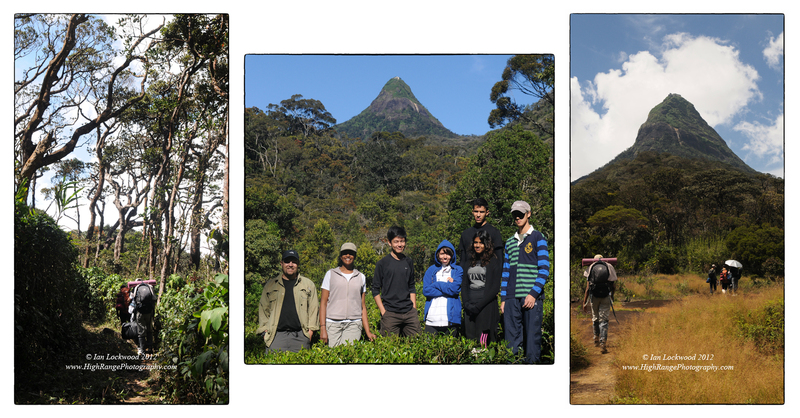 OSC students and teachers before and during the trek to Sri Pada. The first day is spent getting from Colombo to the Fishing Hut. There are opportunities along the way to discuss and evaluate the impacts of large-scale plantations agriculture and hydroelectric schemes on the areas ecology and the country’s economy. The Fishing Hut sits at a confluence of human-dominated landscapes and the mid elevation sub-montane forest that has never experienced logging or degradation. The key learning part of the trip happens on the 2nd day as we hike up through tea plantations and sub-montane forest before entering the cloud forest zone near the upper parts of the peak. 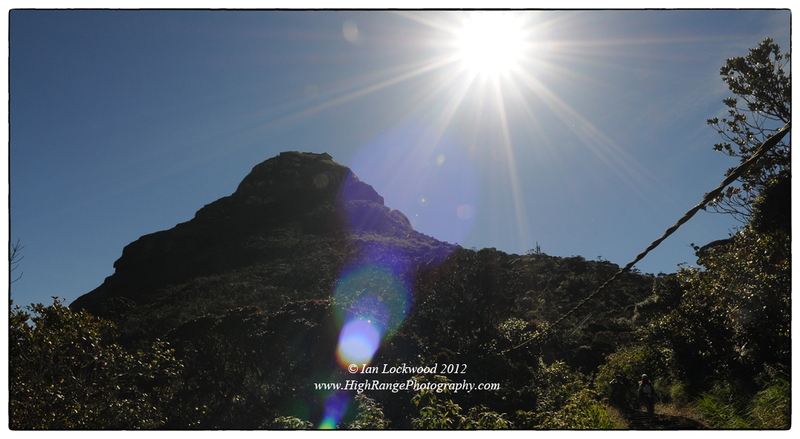 The opportunity to observe vertical zonation as we ascend the peak is a key learning outcome of the trip. We witnessed flowering Rhododendron arboreum trees and large tree ferns (Cyathea sp.) as well as a host of small flowering plants (Exacum sp., various Impatiens sp. etc.). At times some of these plants and larger understory species (especially Strobilanthes sp.) had taken over the concrete path ways! It was amazing to witness the resilience and recovery of the ecosystem in the brief months that pilgrims had not walked the pathways. 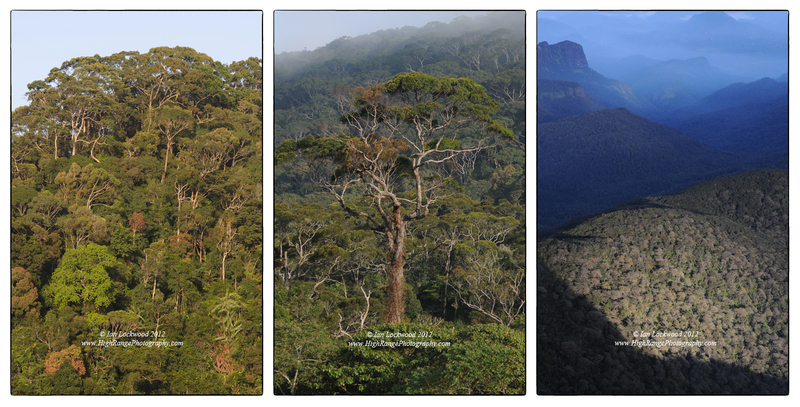 Three types of forest from Sri Lanka’s Central Highlands: lowland rainforest, sub-montane rainforest and cloud forest. 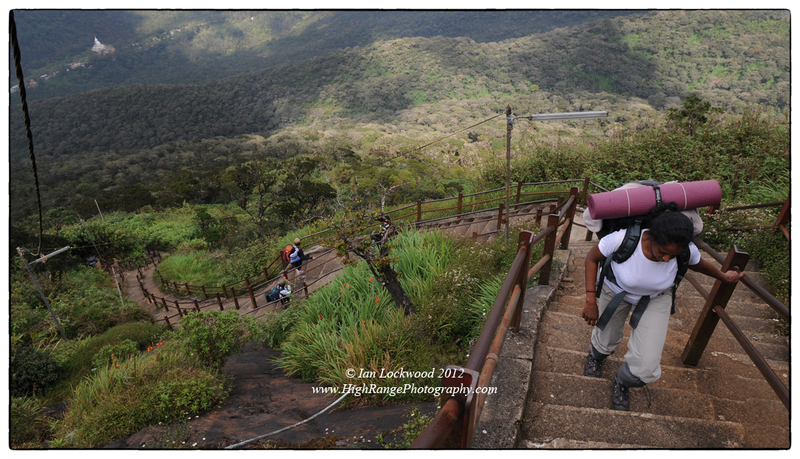 Sonalee Abeyawardene and students from OSC ascending the Hatton path steps to Sri Pada shortly after joining the concrete steps from the fishing hut trail. The Japanese Dagoba is visible on the regular Hatton pathway. 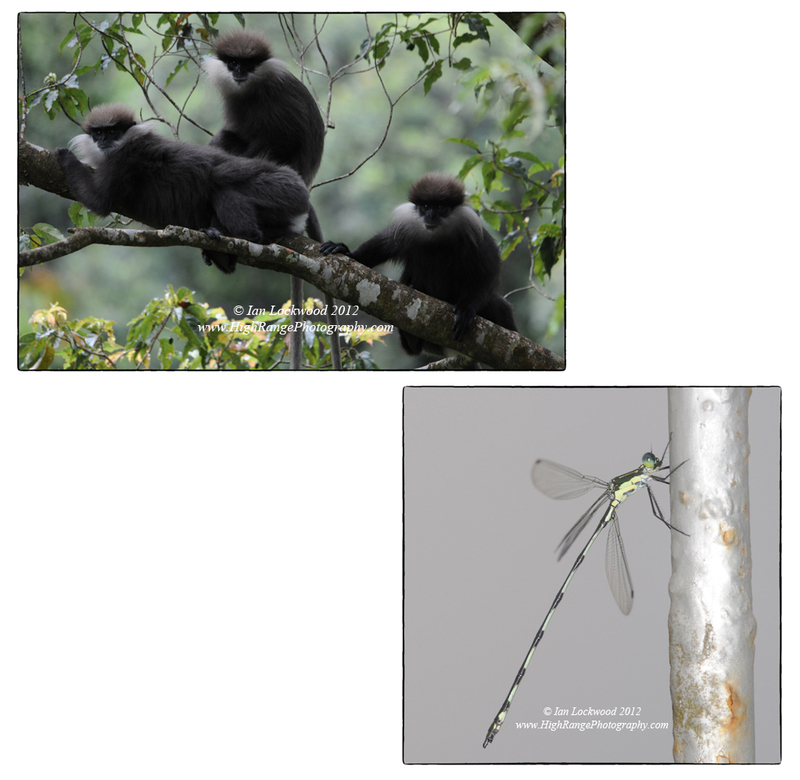 Rare and endangered wildlife from Peak Wilderness: Purple faced langurs (Trachypithecus vetulus) and the rare and endemic Emerald Sri Lankan spreadwing (Sinhalestes orientalis) identified with the expertise of Karen Conniff. Apparently it was last recorded in 1859 but then rediscovered by Matjaz Bedjanič in Balangoda. We found the dragonfly on the summit near the sacred footprint while the langurs were photographed on the Hatton path in forest patches surrounded by tea. Up at the 2,243 meter summit of Sri Pada we caught our breaths, congratulated ourselves on making the climb without injury and then realized that we were all alone in this most holy of holy sites. Mist rolled up from all sides and enveloped us in a moist cocoon. It was chilly and fleece jackets were unpacked along with a late lunch. Occasionally the mist withdrew to reveal glimpses of the lower forests and valleys of tea. When it did, bright sunlight bathed the temple in a silvery glow and projected bits of the peak onto the nearby clouds (the elusive Brocken Spectre effect). The actual sanctuary housing the sacred footprint was locked up but we sat on its side and stared out at the drama of clouds, sunshine and changing landscape. A dragonfly (see below image) had found its way to the temple and clung to a lamp post. This turned out to be the very rare and endemic Sri Lankan spreadwing (Sinhalestes orientalis). Later an officer from the Wildlife & Conservation Department came up and we compared notes on what we had seen. That night the group turned in early (where else would you get teenagers volunteering to go to sleep at 8:00 pm?). I awoke a bit after midnight and wandered around the temple to take in the views of the heavens and lower settlements. The temple was deserted and it was cold with a steady wind blowing in from the east. All the clouds and mist had cleared from the summit. The feeling and view was sublime in a way that I have not witnessed on my fourteen previous visits to the summit of Sri Pada. Without the distracting brightness of sodium vapor and fluorescent lights, one is given a very different view on a clear night. Many of the surrounding valleys and hills lay in inky darkness-areas that fall within the Peak Wilderness area. Far above, stars, planets and occasional shooting stars filled the sky. As if a reflection of the heavens, there were clusters of lights in the hills and lower valleys. Ratnapura to the south, Maskeliya to the north and, perhaps Hambantota to the distant south-east were visible. 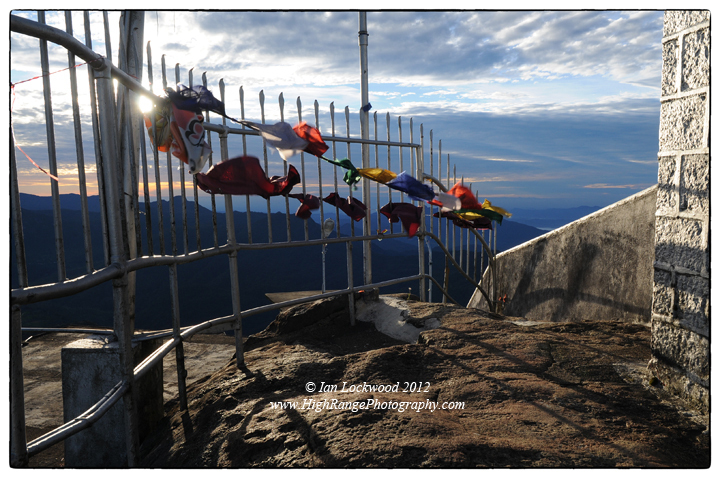 The radar station on Sri Lanka’s highest (2,524 meter) peak Pidurutalagala was a bright beacon to the north east. Colombo cast a dull glow along the western horizon. Two or three large thunderstorms were active over the coast to the south and distant lightening illuminated banks of clouds. I was able to rouse two members of my team- Harshini and Yo- who joined me on the steps by the temple. They used my bulky tripod to take time-lapse images of the views that illuminated the darkness in surreal ways. Harshini, a talented and energetic young photographer, has posted her photos of the trip at Mixbook. Several hours later after an interlude of sleep we were up again to watch the birth of a new day. By now there were other visitors, almost all foreign with guides from Nalathani, who had come up to the peak. The sun soon rose over the Horton Plains horizon and cast a gilded glow on the lower ranges before projecting the mountain shadow that I had been hoping to see. Our whole team was able to witness it leaving all of us with an unforgettable experience. As usual most of the other visitors were intently enjoying the sunrise to the east, ignoring the drama behind them! They soon hurried down and once again we were all alone on the sacred summit. 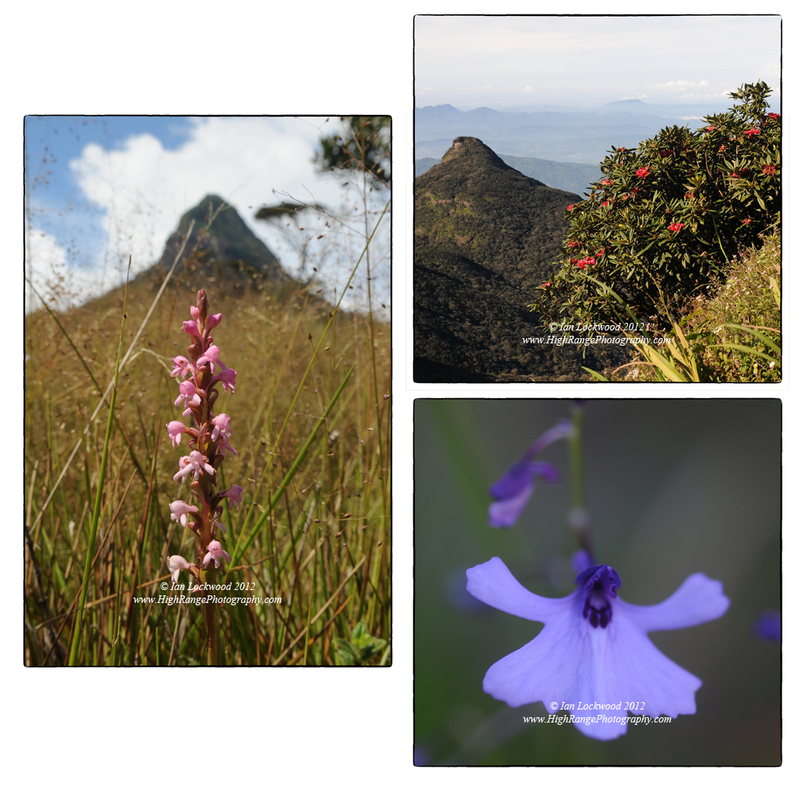 We lingered and stayed several more hours to get a sense of the landscape before going down the Ratnapura steps to Nalathani. The view was exquisitely clear with unforgettable views in every direction. On the decent-always a bit painful with 4,600 plus concrete steps to negotiate- there were no shacks set up to buy tea from or get our tired feet massaged at! Nevertheless once again a small group of OSC students and faculty returned from Sri Pada’s ancient summit with a great sense of fulfillment. The Knuckles Range as seen from Sri Pada looking due north. The city of Kandy is in one of the lower valleys between Sri Pada and Knuckles. 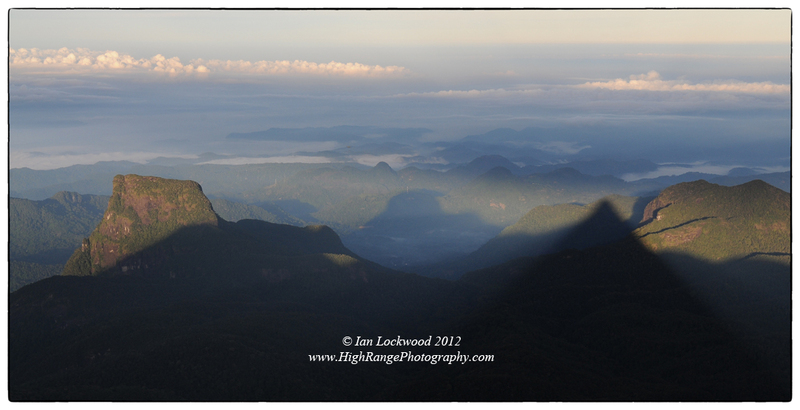 Mountain shadow projected by Sri Pada , looking west towards Colombo over the Peak Wilderness forests. West view from Sri Pada showing mountain shadow shrinking over the Peak Wilderness forests. Temple summit on Sri Pada looking east. 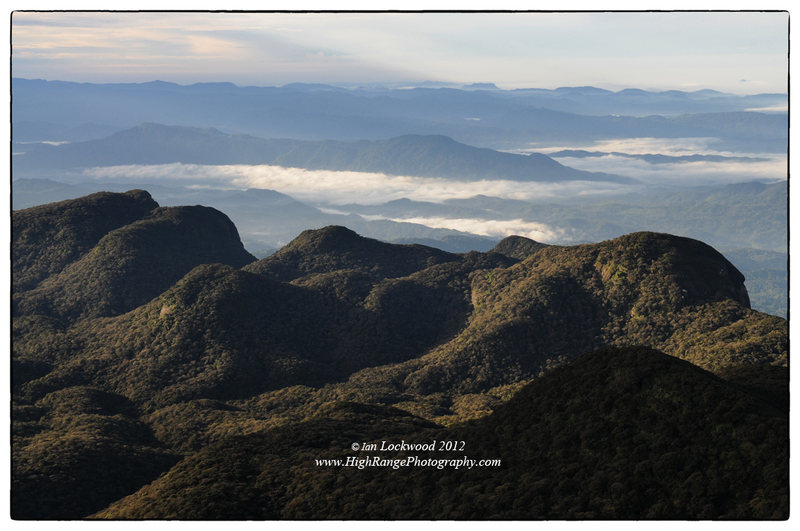 Looking south towards Sinharaja from Sri Pada over sub-montane forest in the Peak Wilderness area. West view panorama from the lower steps of Sri Pada. The last shadow of the peak is still visible. 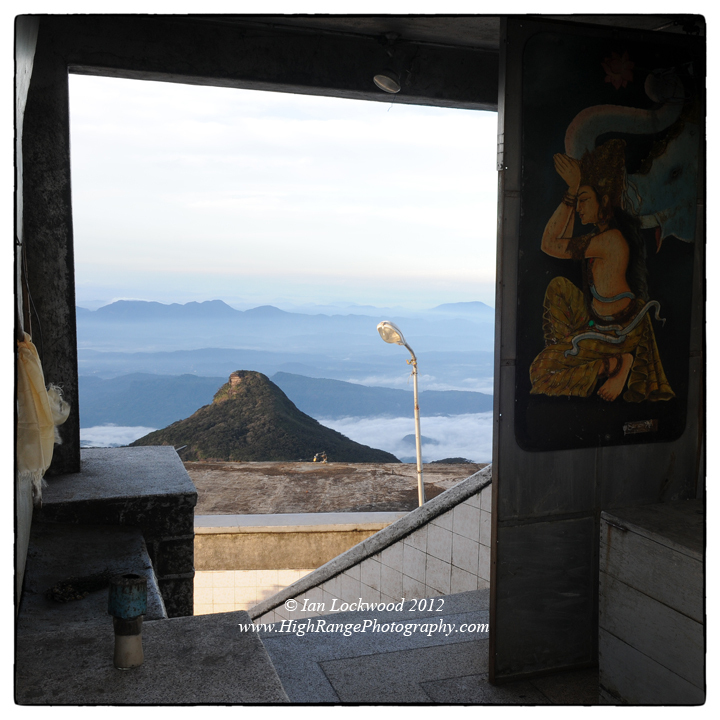 Temple doorway on Sri Pada’s summit, looking south.